Each volume in the Notre Dame Series on Quantitative Methodology features leading methodologists and substantive experts who provide instruction on innovative techniques designed to enhance quantitative skills in a substantive area. This latest volume focuses on the methodological issues and analyses pertinent to understanding psychological data from a dynamical system perspective. Dynamical systems analysis (DSA) is increasingly used to demonstrate time-dependent variable change. It is used more and more to analyze a variety of psychological phenomena such as relationships, development and aging, emotional regulation, and perceptual processes. 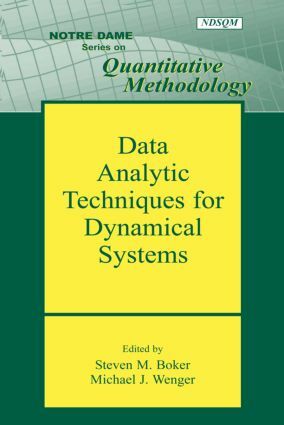 Data Analytic Techniques for Dynamical Systems is beneficial to advanced students and researchers in the areas of developmental psychology, family studies, language processes, cognitive neuroscience, social and personality psychology, medicine, and emotion. Due to the book’s instructive nature, it serves as an excellent text for advanced courses on this particular technique. Contents: S.M. Boker, Preface. B.I. Bertenthal, Dynamical Systems: It's About Time. M.W. Browne, Repeated Time Series Models for Learning Data. F. Hamagami, J.J. McArdle, Dynamic Extensions of Latent Difference Score Models. J.H.L. Oud, Continuous Time Modeling of Reciprocal Relationships in the Cross-Lagged Panel Design. S.M. Boker, Specifying Latent Differential Equations Models. S.E. Maxwell, S.M. Boker, Multilevel Models of Dynamical Systems. P.C.M. Molenaar, P. van Rijn, E. Hamaker, A New Class of SEM Model Equivalences and Its Implications. J.L. Rodgers, A.M. Johnson, Nonlinear Dynamic Models of Nonlinear Dynamic Behaviors: Social Contagion of Adolescent Smoking and Drinking at Aggregate and Individual Levels. M.J. Wenger, A.M. Copeland, C. Schuster, Gestures as Psychophysical Judgments.